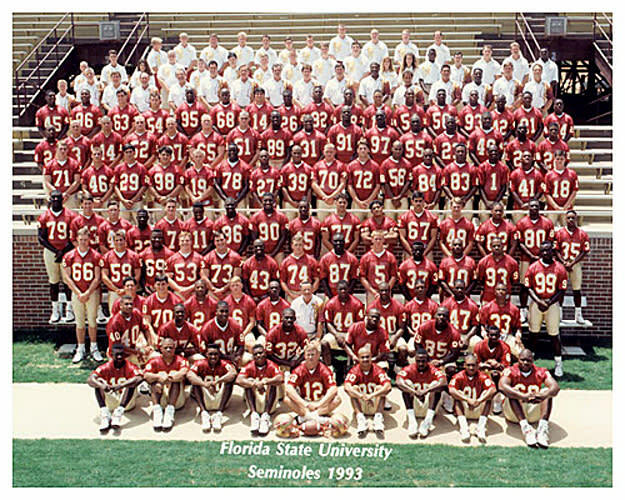 There are teams that are stacked, then there's the '93 Florida State Seminoles. Led by Heisman winner, Charlie Ward, (who, by the way, played basketball, baseball and tennis at high levels during his collegiate career), the Seminoles scored an average of over 40 points per game, surrendering only one loss to Notre Dame on their road to a national championship. Three consensus All-Americans + six players selected in the 1994 NFL draft x Ward who was an NBA first round pick = straight up unfair.